In practice, the risk tolerance constraints (i.e. maximum expected default probability at the company’s target rating) of rating agencies determine the minimum amount of capital that a company needs to secure the rating it needs to execute its strategic plan on a going concern basis. When a company’s available capital is higher than this minimum, the company uses a fraction of its risk capacity, equal to the ratio of this minimum amount to available capital. If available capital is lower than this capital requirement, the ratio becomes greater than one; the company is overextended and needs to take corrective action. In this discussion, we are deliberately refraining from using “economic capital” as a measure of capital utilization, capital availability, risk capacity or risk capacity utilization because the term “economic” can have several distinct meanings that create confusion. We focus on measures of capital and risk capacity that can provide robust guideposts for making decisions about management and deployment of a company’s risk capacity, in relation to its available capital. In the wake of the financial crisis, many companies are trying to determine how large a capital safety buffer (including off balance sheet contingent capital) they should have to absorb losses caused by catastrophic events while containing the negative impact of additional capital on profitability metrics, especially their return on shareholders’ equity. In practice, they would like to hold enough capital to ensure that their insurance strength rating would remain at or above the level needed to sustain the confidence of customers and regulators over a suitably long time period (e.g. ten years) at a high confidence level, while avoiding declines in returns that might reduce their valuation multiples. As shown by the figure, a company’s capital requirement represents its risk capacity utilization under its strategic plan as well as its risk appetite. 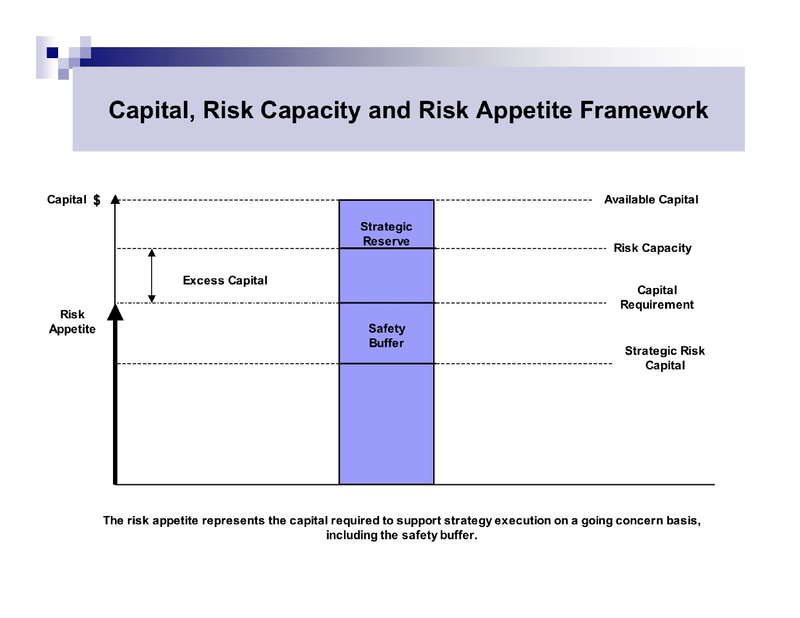 When this capital requirement, including the suitable safety buffer discussed above, is smaller than the company’s risk capacity (as shown on the figure) the company has “excess capital”. It has an option to deploy some or all of its excess capital productively or return it to investors. When this capital requirement, including the safety buffer, is greater than the company’s risk capacity, a company is overextended and need to take action to reduce planned capacity utilization or raise additional capital to increase its risk capacity. The mutual dependency of a company’s risk profile, risk capacity utilization, risk capacity, capital available and risk appetite and the irreducible uncertainty of financial results of insurance activities create a context in which management needs to ensure that risk capacity management and strategy management are aligned with the return expectations and risk concerns of shareholders. Note: This article is abstracted from the “Risk Management and Business Strategy in P/C Insurance Companies” briefing paper published by Advisen (www.advisen.com) and available at the Corner Store. This entry was posted on March 7, 2011 at 5:05 am and is filed under Economic Capital, Enterprise Risk Management. You can subscribe via RSS 2.0 feed to this post's comments.